The Active Asset Allocator was handsomely rewarded with an overweight position in bonds in 2014. This year, we are diversifying into corporate and inflation linked bonds while we wait for a compelling entry point into the stock market. In the meantime, our overweight gold position is working well. Our overweight position in equities worked in 2012 and 1H2013 and our overweight position in bonds worked in 2014. Gold is shaping up to be the trade of the year in 2015 and we fully intend to participate. Why don't you join us? We are not fussy where the returns come from, only that they do come in some form. We start this month's update with a recap of the current positioning of the Active Asset Allocator investment strategy. As a reminder, the Active Asset Allocator invests in a mix of global equities, bonds and precious metals, the allocation of which is actively managed and determined by each market's primary trend. One of our tools, the technical trend indicator, delivered a 'sell' signal in October 2014 and has remained in defensive mode ever since. As a result, the Active Asset Allocator remains defensively positioned today with an allocation of 20% global equities / 30% bonds / 30% gold / 20% cash. While European stock markets have started 2015 on a firm footing, US equities have traded in a weaker fashion, chopping sideways in the first six weeks of the year. US equities now account for 57% of the typical investment manager global equity benchmark and this is why we focus so much of our time and research on this region. A break below support will have us sitting tight in defensive mode and focusing on a low risk place to rebuild our equity exposure. If we get a sustained break in the S&P 500 above resistance and out to new all time highs, we will increase our equity allocation, despite current expensive equity valuations. If we increase our equity exposure, we will have a clearly defined exit strategy in place in the event that the market turns lower later in the year. 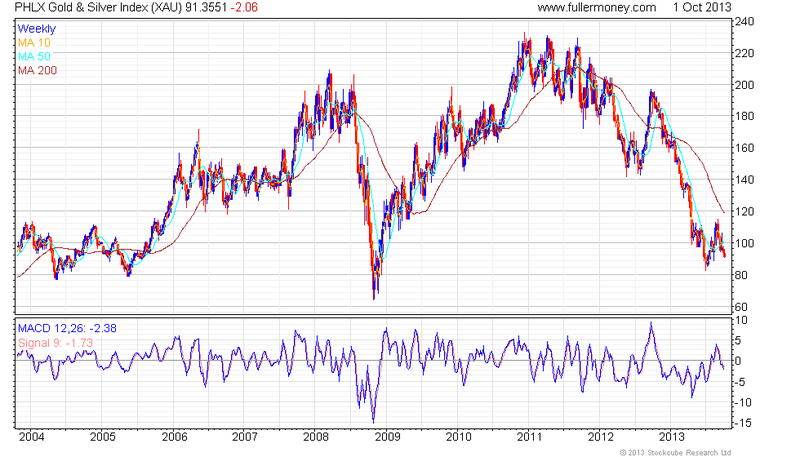 We have come a very long way from the March 2009 stock market lows - over 200% in fact if the S&P 500 is your benchmark. In that time, the VIX (FEAR) Index, a key measure of stock market volatility (blue dotted line below) has returned to pre-crisis lows, falling from a crisis peak of almost 80 in 2008 back to 12 in December 2014, an -85% drop. The Vix Index rises on fear and falls on greed. It reached multi-decade lows in December 2014. However, in the first six weeks of 2015, we have seen a +45% jump in the Vix, our stock market volatility barometer, from 12 to 17.5. Investor complacency has given way to a small degree of investor angst. It is too early to tell just yet if this is an emerging trend, but our interest is piqued. This next chart should give the equity market bulls something to think about. Here we see real NYSE margin debt growth - basically investors borrowing to invest in the stock market - at a new all time high, above both prior peaks in 2000 and 2007. Amazing. 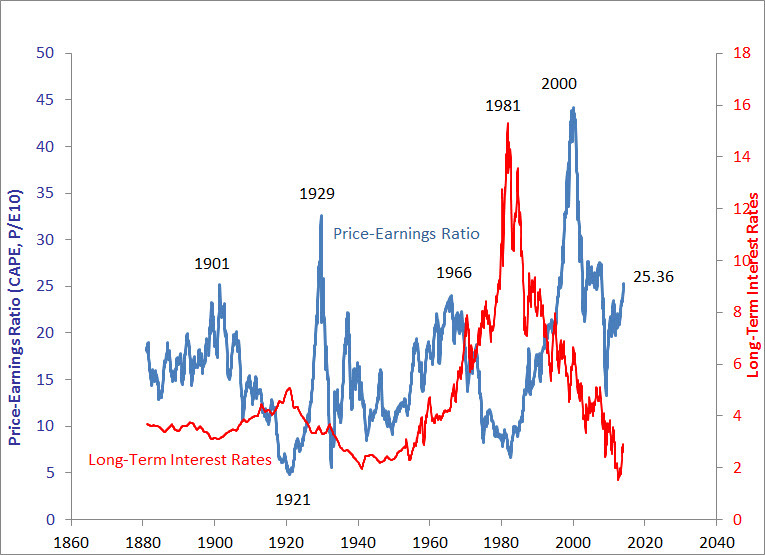 If/when margin debt peaks and starts to turn lower, the stock market will be in trouble. Margin debt growth may have peaked in February 2014. We will have to wait and see. Let's end the equity market update on a positive note. Healthy bull markets require a majority of stocks to participate in the uptrend. The Advance/Decline Line - a key input into our Technical Trend Indicator - captures this trend and so far, the trend continues in a bullish fashion. 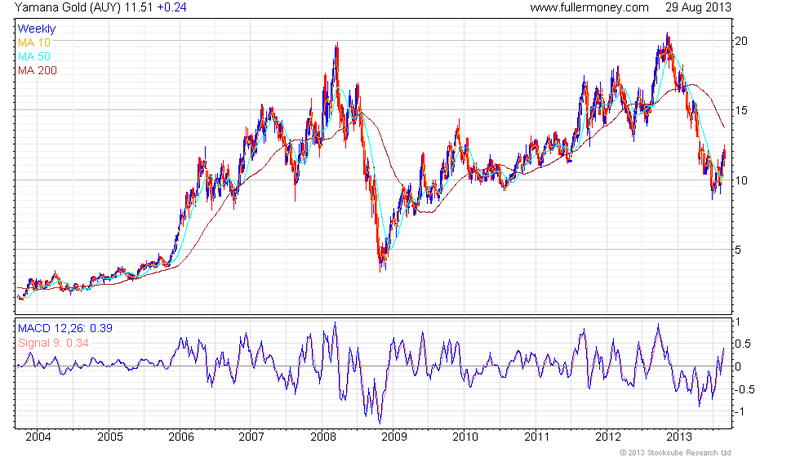 The A/D Line hit a new all time high just last week, tipping the scales once again in favour of the bulls. Other inputs into our trend indicator are more cautious but the A/D Line is signalling that new highs lie ahead. 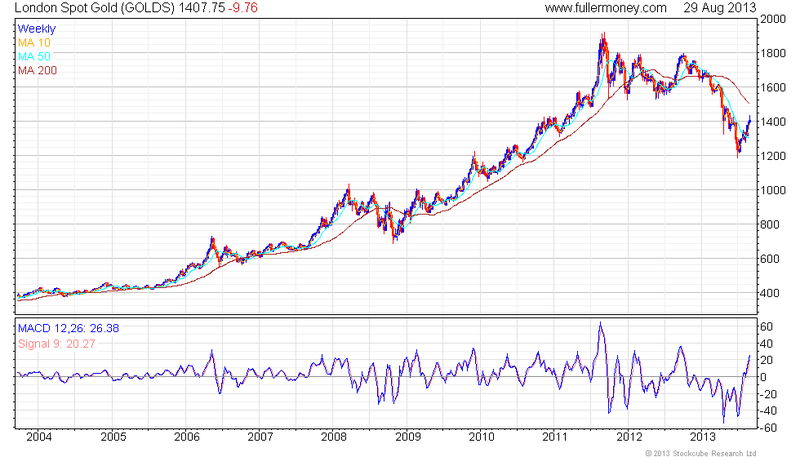 Typically, the A/D Line tops out weeks or months before the stock market as you can see in the following chart. We wait patiently for the market's next signal. US real GDP has grown by 2.2% per annum for the past four years, accelerating to over 4.0% in the last six months, with no real sign of inflation or deflation. 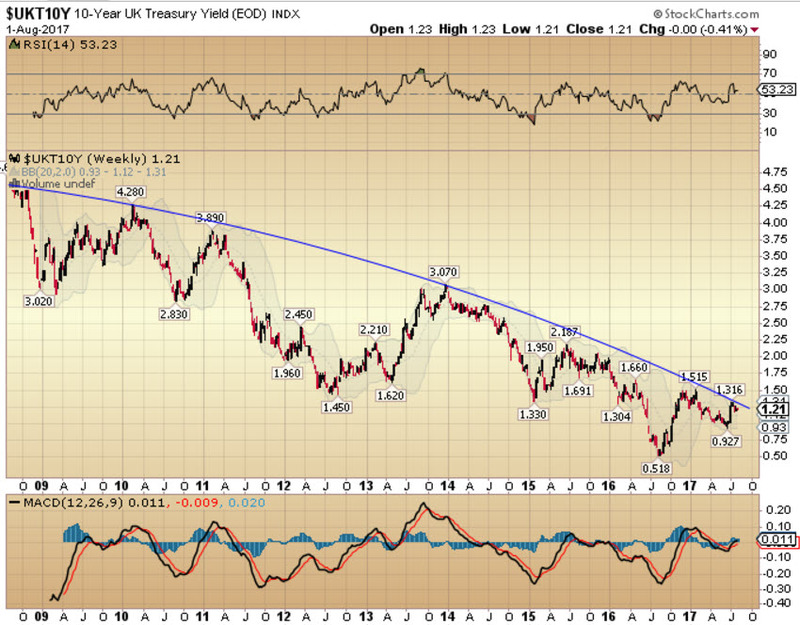 US 30 year treasuries are currently yielding 2.6%. In the Eurozone, real GDP growth has grown by +0.3% pa over the same period, nudging higher to +0.4% in recent months, while deflation remains the prevailing threat. German 30 year bunds currently yield 0.9%. Neither bond market offers compelling value, while both appear to be discounting a slower growth and/or recessionary environment in the not-too-distant future. However, capital has been treated well in the fixed income markets and as long as that trend continues, the bond bull market won't die. The Active Asset Allocator currently holds a 30% allocation to Eurozone government bonds (1.3% yield, 10 year duration), a 5% allocation to Euro aggregate bonds (0.7% yield, 6 year duration) and a 5% allocation to Euro inflation-linked bonds. The Active Asset Allocator was handsomely rewarded in 2014 with an overweight position in Eurozone government bonds. This year, we are diversifying into corporate and inflation linked bonds, while we wait for a compelling entry point into the stock market. 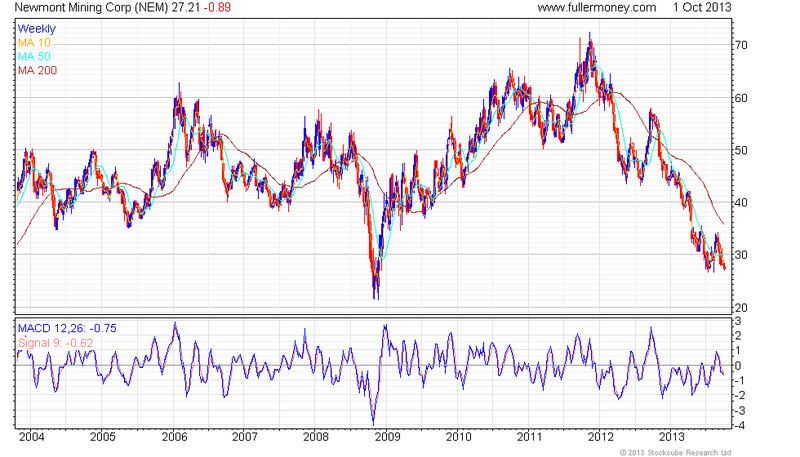 In the meantime, we continue to benefit from our overweight position in gold. Our overweight position in equities worked well in 2012 and 1H2013; our overweight position in bonds worked well in 2014; our overweight position in gold is working well so far in 2015. We are not fussy where the returns come from, only that they do come in some form! We increased the allocation to gold in the Active Asset Allocator from 20% to 30% in December 2014. Shortly afterwards gold took off, rallying +20% in euro terms before giving some of that back in the last week. We will likely cut back the allocation to precious metals in the Active Asset Allocator shortly and wait patiently for the next safe entry point, likely to come in April or May. Gold is gearing up to potentially be the trade of the year for 2015 and we fully anticipate being on board along with our clients. For any prospects reading this evening, please do get in touch and we can show you how to implement the Active Asset Allocator in a very cost effective way. I reduced the allocation to equities in the model portfolio from 50% to 20% in the third week of June 2013 and continue to run with that asset mix today. 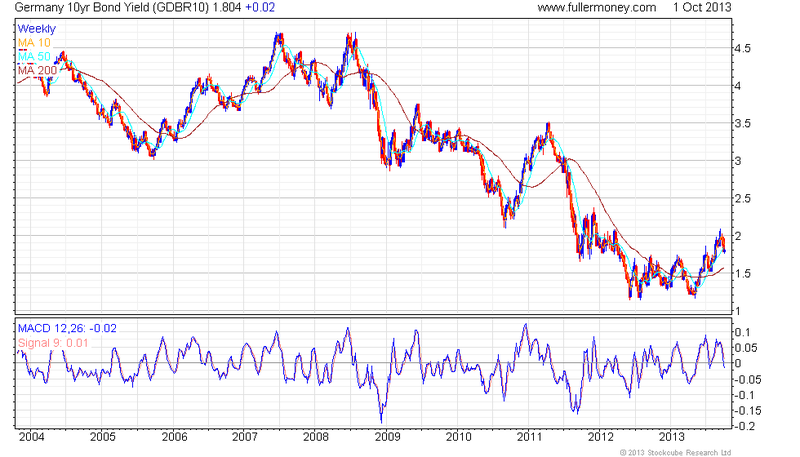 20% of proceeds were invested in 5+ Year Eurozone government bonds and 10% in cash. The current asset mix remains at 20% equities / 50% bonds / 20% gold / 10% cash. Given that stocks remain overvalued (the price/earnings multiple on the S&P 500 is 19 times based on 2012 net reported earnings), investor sentiment remains overly bullish, we are 4.5 years into the current equity bull market (compared to 3.8 years for the long term average) and a number of my technical indicators are tipping into bearish mode, I continue to recommend a defensive position for now. Stock market tops are a process. After breaking 1,400 for the first time in July 1999, it took the S&P 500 another 15 months to hammer out a major top before plunging in October 2000. 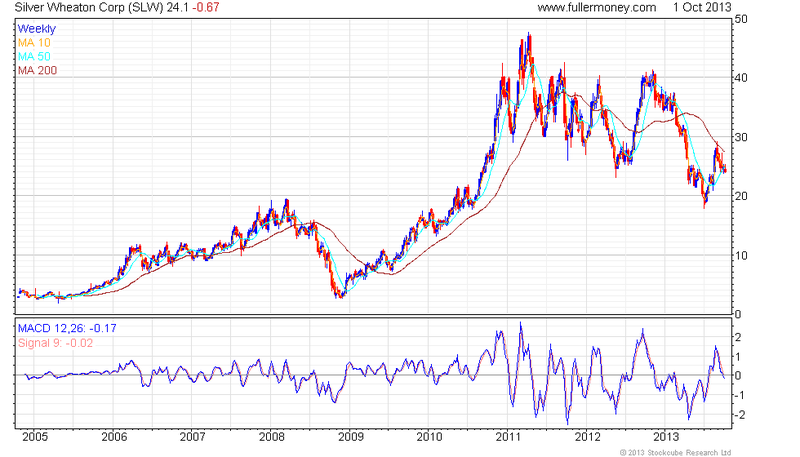 The second major bull market peak in recent times began to take shape in 2007. The S&P started to wobble at 1,450 in February 2007. Then, in October 2007, US equities experienced a sharp -20% correction from 1,576 to 1,257 in five months. The relief rally lasted all of two months before the wheels came off. All in all, coincidentally, it again took 15 months for the US stock market to complete the topping process before collapsing in 2008. This time around, top-calling is a little trickier. The Fed has begun to talk about tapering their massive monthly purchases of treasuries and mortgage backed securities. However, talk is cheap. Mr. Bernanke has an unlimited monetary arsenal at his disposal and could resume his QE project at the drop of a hat if economic data start to soften again. More QE could mean ever higher stock prices. At some point though in the not too distant future - we could be there already - continued Fed intervention will be perceived by investors as the problem rather than the solution. Stock prices will stop going up Federal Reserve announcements of additional money printing. Then they will start going down and that will be a sight to behold. The tide has started to turn in my opinion, which means that the next 12 months could prove quite challenging for stock markets. Let's examine the stock market's technical setup for clues that the four year uptrend may be waning. This week, for the first time in over a year, my technical trend indicator has tipped over into the red, testing support at the long term moving average. Investors should take note of this early warning signal that the uptrend in the stock market is deteriorating. 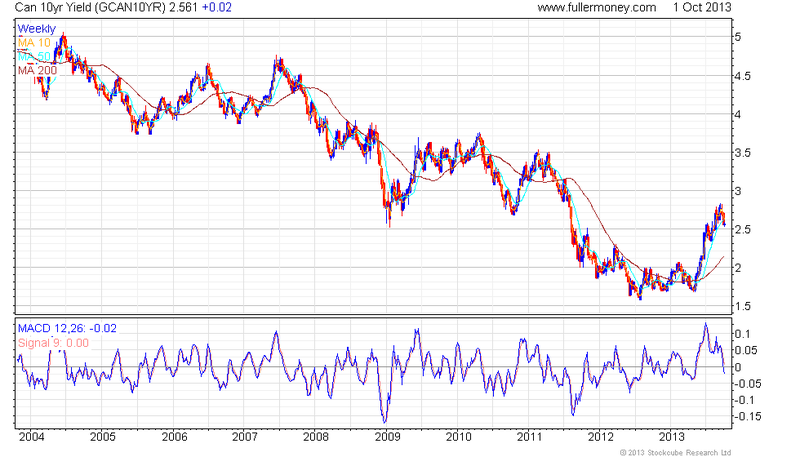 The technical trend has started to break down. We can also see some initial signs of an overall weakening in this equity bull market by examining the Advance / Decline Line of all NYSE traded stocks. The A/D Line graphically displays the relationship between the number of stocks in rising trends versus the number of stocks in declining trends. In a healthy bull market, you should expect to see the majority of stocks in rising bullish trends. However, late in every bull market, the number of stocks participating in each rally falls until such a time that the trend peaks and reverses. For example, in 2007, we witnessed a negative divergence in the A/D Line for months prior to the stock market peak as fewer and fewer stocks participated in the rising trend. We are starting to see the same behaviour today. The Advance / Decline has not confirmed the recent high in the US stock market. Fewer stocks are participating in the rising trend, which typically happens close to bull market peaks. In addition to the initial signs of technical deterioration we see in the stock market, investor optimism has also reached a rather bullish extreme. Taken together, excessive bullish sentiment and initial signs of a technical breakdown in the stock market should provide food for thought for those with a bullish outlook. Last time we reached a similar low level of investor bearishness was just prior to the stock market correction in May 2011; before that was just before the wheels came off in 2008. Buyers beware. Bearish sentiment has reached lows that have marked similar peaks in stocks in the past. Permission was provided by Sentimentrader to post this chart. 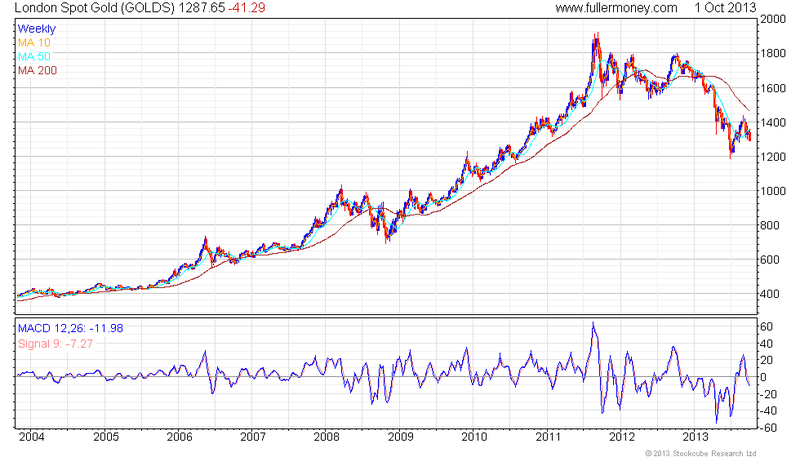 Here is a longer term view of the same chart. There is still room for bearish sentiment to decline further (and stock prices to continue to rise), but a correction to reset sentiment is not far off. Long term view of investor bearish sentiment. Permission provided by Sentimentrader to post this chart. Like clockwork, and coincident with the low levels of bearish sentiment graphically shown above, investors are back in confident mood and returning to the stock market in their droves, with many going on margin (borrowing) to do so. Margin debt peaked at close to 2.8% of nominal US GDP in 2000 and again in 2007 as the S&P 500 was making a multi-year top in each instance. Margin debt levels are surging higher again and I fear the same result for stock prices in the months and years ahead. Investors are as confident again now as they were in 2007 with a record number borrowing on margin to invest in the stock market. Evidence is building that the current stock market rally is running into trouble. Stocks remain overvalued, investor sentiment remains overly bullish, and a number of my technical indicators are tipping into bearish mode. It is therefore prudent to continue to hold a defensive position for now as recommended in the model portfolio. Global bond yields are rising. Central banks are losing control of their interest rate setting ability. Long-term interest rates are rising across the world. US 10 year yields have risen 100 basis points from 1.76% to 2.76% in the past 8 months, despite the Federal Reserve printing $680 billion during that time to buy US government bonds. 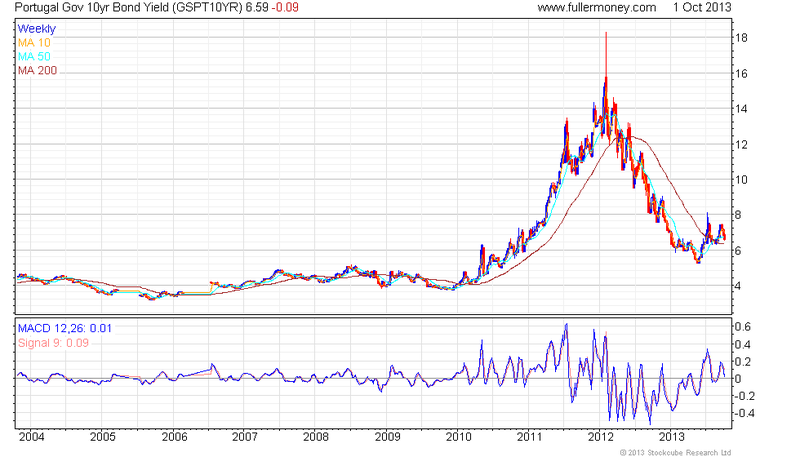 The bond market is signalling its discontent with Federal reserve policy of unlimited money printing. Rising interest rates will be the trend of the future, so investors that buy bonds should only do so for tactical reasons and always invest at the short end of the yield curve. After a 2 year correction, the gold bull is back. The gold correction lasted from the peak in September 2011 of $1,921 to a trough in June 2013 of $1,180, a steep decline of -39%. 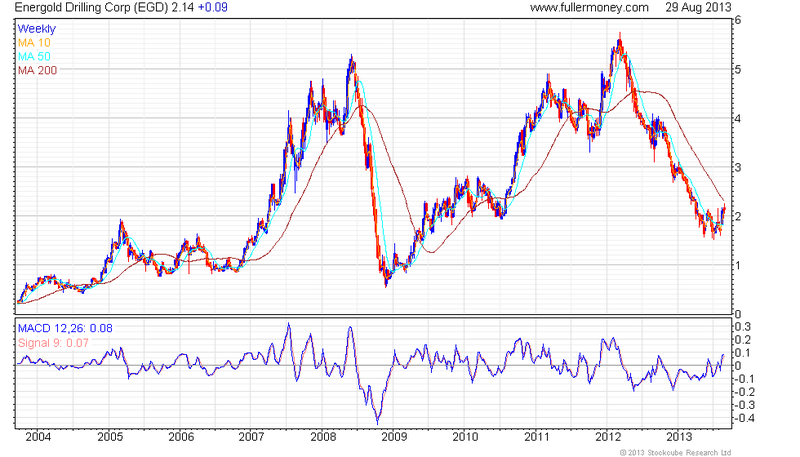 Now, I expect gold to make up for lost time and challenge the all time highs over the next 6-12 months. 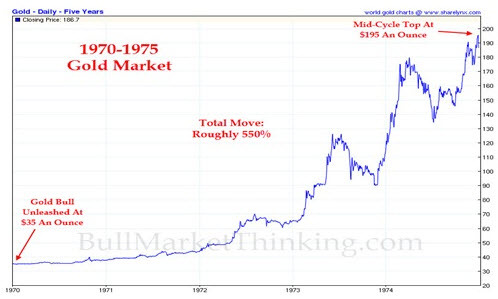 During the last gold bull market of the 1970's, gold corrected in price from $200 to $100, a -50% decline before surging higher to a peak of $850 in 1980 as inflation ran wild. This time round, following the $1,180 low in June, gold has already recovered $240 to reach $1,420. 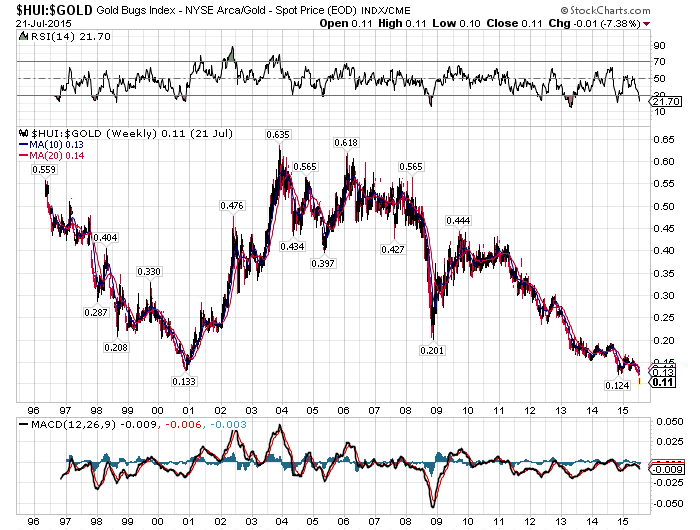 If I am right about gold, we should see a strong move higher over the next 3-5 years as the bubble builds momentum. Despite gold's recent 20% rally off the June lows, investor sentiment relating to the sector remains in the doldrums. Investors have thrown in the towel and have been very slow to return despite the recent turnaround in performance. This behaviour is exactly what is required to drive the gold bull market higher over the medium-term. As you can see from the next chart, the popular Rydex Funds are showing no signs of investment inflows into their precious metals funds. We have a long way to go before fund inflows return to the levels of 2010 and 2011. Fund flows into the Rydex gold funds suggest indifference to the current rally. this is exactly what is required to propel gold higher in the months and years ahead. The gold mining stocks, after getting taken to the woodshed earlier this year, are also making a comeback. While gold has rallied +20% in 6 weeks, the gold miners as measured by GDX, have already tacked on +39% over the same period. It is too early to get excited yet, but the prospects are definitely looking better. It's always darkest before the dawn. Hold your gold position and add on weakness. The next three years are going to be very profitable for precious metal investors.